Getting to know and trust someone takes time. It’s also a give-and-take experience. When it comes to our relationship with God, He speaks to us through the Bible; we talk to Him through prayer. But prayer is not an easy discipline. You may have a husband and children. You may have a career outside your home in addition to your job at home. You may serve in your local church. You may be thinking, “There’s no way I can develop my prayer life!” But there is! You can commune intimately and meaningfully with God! “How?” you groan. 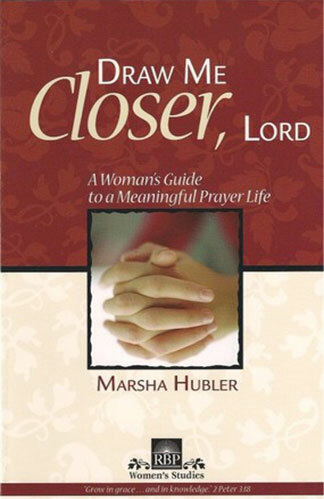 In her book DRAW ME CLOSER, LORD, Marsha Hubler shows the way. find helpful ways to pray effectively for others. So if you’re ready to learn how to make prayer a vital part of your life, get your Bible, your pen, and empty journal, and DRAW ME CLOSER, LORD: A WOMAN’S GUIDE TO A MEANINGFUL PRAYER LIFE. Soon you’ll be on your way!